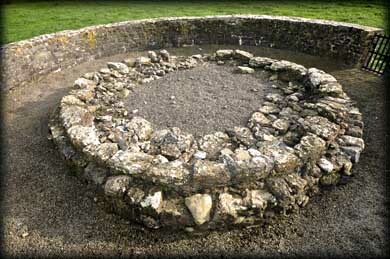 The round tower at Liathmore was discovered during excavations in 1969-70. 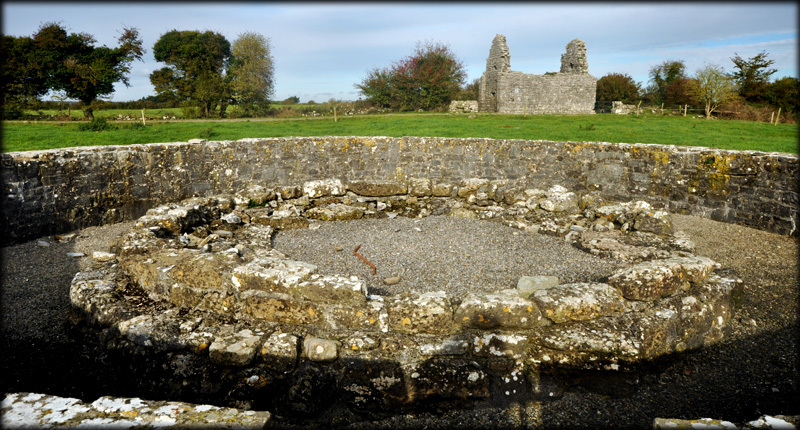 It lies equidistant between the two remaining medieval churches at Liathmore. The tower is southwest of the 11th century church at an unusually acute angle to the western doorway. During the excavations they found worked ashlars from the drum and these were used in the reconstruction of the first layer of stones resting on the foundations. At 2.6 metres deep the foundations are quite deep compared to most other round towers leaving us with questions as to why this tower collapsed. Situated: Heading south on the M8 take exit 4 for Urlingford. From there head south down the R639 for about 6 kilometres. There is a track on your left up to a farm. Signposted. Another sign points to the churches. Best to walk from here. Very muddy wear boots. Discovery Map 67: S 2242 5765. Last Visit: Nov 2013.